With an explosion of bike commuters over the past year as wallets have taken a hit from rising gas prices and declining income, it’s sometimes a little tiresome to see the mass media still portraying bike commuters as fringe extremists with a message. I think most of you are people like me who just ride a bike and mostly enjoy doing it. They’re people like Tom in his suit in New York, or Mark with his box bike in Richmond, Indiana here. What do you think? Are the interests of cyclists served by portraying us as eccentrics? Do we admire the loudmouths and their work? Or am I overreacting and we all recognize that the media portrays the fringe elements because that’s what makes for interesting television? I think the media likes the eccentrics and will cover them. Anything with a visual element that pulls you in. I have been a bike commuter for 25 years, only in the last 2 have I been newsworthy. Now I ride a recumbent, it might qualify as odd enough for news coverage. In my opinion, we are still at the stage where we just need to see more coverage, no matter who has the spotlight, for cycling interests. Once cycling becomes boring, we are mainstream, and facilities are just a part of life. It may be that a commuter on a regular bike is just not that shocking anymore. Maybe the media needs the hook of a box bike, or a suit wearing cyclist to get attention. It’s all marketing these days. Whether it’s McDonald’s or Rupert Murdock. It’s all about what sells and outrages or cements your misled notions about a certain subject, not about the truth. You think the two people pictured above would make Joe Idiot on his riding lawnmower in the middle of Podunk Midwest watch anything having to do with bikes? Nope. Put some body painted freaks on some burning man death-traps? Yes… that’ll do er! I think TV will always portray bike commuters as weirdos, because Mobil and Ford buy a hell of a lot more ads than Cannondale does. i think you hit the nail on the head – what you said really resonated with me. bicycle commuters are often portrayed in the media as wimps, geeks, eccentrics… and other type of people who are marginalized as irrational. anyone who doesn’t buy into the car-commute dream is a weirdo. – steve carrel’s 40 year old virgin. while eccentrics do make good visuals, they also propagate stereotypes. I like the “mostly” you put in “mostly enjoying it”. While I like commuting by bike more than I like commuting by car, it’s still commuting, as in “something I have to do”, and when it’s cold and rainy, well, it’s just not all that nice. But I think that’s an important aspect: it’s not something you do on a whim, but because it’s the practical and useful thing to do. That’s why I wear normal clothes, not lycra, and I don’t use a carbon fibre bike to commute (I do have a sporting bike that involves carbon fibre, and I’ll often wear lycra when I ride it). I’d like commuting by bike to be something ordinary, that everyone can do if it happens to be convenient for them, not something weirdos do. No, being portrayed as eccentrics does not serve the interests of cyclists. Rather, it makes it easier for non-cyclists to discriminate against us. Cyclists need to be seen as people that others can identify with, not as mere objects of entertainment. I suggest you contact that journalist and ask her if she thinks it is responsible to portray cyclists in dangerous traffic as something other than human beings who deserve respect and safety. When you’re doing something that’s not completely ‘mainstream’, of course you seem to be a bit of a weirdo to the Luddites still stuck in their cars. If the offer is to take part in the documentary, then I’d go further. Ask to be on the editorial team. Then work to shape the message from, “Look at these bearded, sandal-wearing freaks, risking their necks when they should be driving”, to, “These are normal people getting about town in an amazingly convenient and pleasant way”. No. But I’m also available for counter-espionage work, and the fermentation of revolutions against foreign governments. The media is a two-edged sword, no doubt. Speaking from personal experience, I regularly get a question or comment (usually positive) about my bike when I’m in an elevator with my ride. It’s nothing special, and I doubt anything that I say will convince them to take it up. But I try to put the best face on the bicycling community everywhere I can. Working in media (albeit not news media), I think their reason for covering stories in this way is much less big brother than a few have suggested. It’s less about who’s advertising and more about what makes an entertaining story. Stories are also influenced by personal bias. But we as cyclists are just one of many populations ill served by the news media today. And the sad thing is, we have no one to blame but humanity. If people wanted the whole story, that’s what the media would be presenting. Unfortunately that’s not what the market demands. I recently had an article written about me commuting 40 miles roundtrip, mainly because it is “unusual,” in my part of the world, and most people, including friends and colleagues think I’m nuts for doing so, drivers consider me a complete nuisance. However, I love to cycle, and put up with all this negativity, willingly, because what I’m doing benefits me, society and the planet, and is simply the best method of transport I have ever experienced. Run that one by me again Karl? I’m with the Dutch/Danes. Make it an everyday, normal thing to do. Build the infrastructure for it and get people on bikes. Or put another way, drivers clinging to an old way of life that’s increasingly looking like it has little future? Propping it up with a bunch of vested interest groups? The Luddites weren’t about fear of technology, but fear and resentment of change that threatened their world view. These days, I’d call them C.A.V.E. men. in the midlands and north of England. b. transf. One who opposes the introduction of new technology, esp. into a place of work. a. The practices of the Luddites. b. Also luddism. More generally, intense dislike of or opposition to technological innovation. as a heavily tattooed person for over 20 years I have seen the public go from being fascinated by us as sideshow to respected as individuals. I hope that this period is much shorter for bike folks. it seems like the important thing is weight of numbers, once the ‘mainstream’ is faced with bike commuting every where it looks it will cease to be a funny niche and become ‘just the way theings are.’ Til that happens Im afraid the infrastructure will be harder to get, as long as ‘they’ see us as a wacky fringe then our demands will seem equally wacky. I guess if I saw it as a choice between a more representational sampling of bike commuters vs the fringe element, I’d like to see something more representational, but the reality is that those people are not really news, so the real choice is between the eccentrics and no one. I choose the eccentrics. Leaving comments in an obscure poetic form? I thought that was only me. And then only on Twitter. Or is it just for cadence and punctuation? A 40 mile round trip commute by bike isn’t terribly unusual here in the Netherlands. I do it, and several other people near-by do the same. In fact, it’s hard to think of anything that is all that unusual if it involves a bike. Press coverage of cycling here is never sensationalist, and never makes cyclists out to be freaks. It’s a normal part of everyone’s life, and it is portrayed as such even though the car companies spend more on ads than the bike companies do. 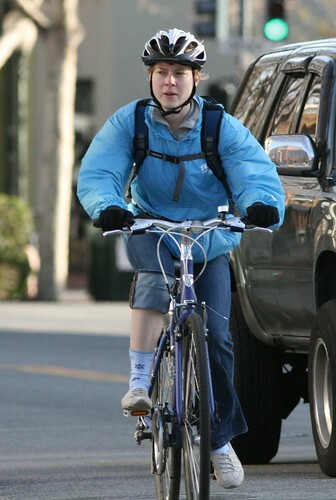 Think of all of the positive characters that ride a bike: Pipi Longstocking, 40 year old virgin, PeeWeeHerman, r.v. Robin Williams, Kevin Kline in In and Out. Why do these characters have to be so quirky? Is that the impression of cyclists? How about a person who is fit and enjoys riding? I think that is the “normal” person. Well, that’s American cinema. It’s similar in the UK. Cinema reflects real life, or at least the majority view of what real life is. However, look at the cinema from countries which have a lot of cycling and you’ll see normal people riding bikes without it being a comment on anything. Cycling is always presented in a positive way here. Take a look at the promotional film here and here. In Montreal, we get 7 feet of snow in a typical winter. Every time there’s a snowstorm, you can bet your last dollar that the next morning, at least one the local newspaper is going to have a picture of a cyclist riding trough the storm on their front page. Eccentric characters or wise commuters? Today’s eccentrics are tomorrow’s “normal” people, and with less than 1% (IIRC) of the US population commuting by bicycle, I’d say we still qualify as eccentrics. I’d be happy to get the coverage. The more exposure, the better. Maybe 99% of the people who see the piece will never change, but that last 1% just had a seed planted. Illustrative Anecdote: I remember the first two people I ever met who talked about home schooling their children. They were a little weird. They had odd fashion sense. They had strange ideas. They didn’t really fit in, and people had a tough time including them in social activities. Naturally I thought their “home schooling” idea was pretty strange, too. A few years later home schooling was mainstream, and I even admired people who could swing it as bastions of free market idealism. Home schooling is no more “new” than bicycling is, but it’s time had returned. The media is pathetic and are the real kooks freaks and weirdo’s.The media is not your friend but try real hard to make it look like they are.Basically they are like prostitutes that have herpes trying to french kiss you.